It's Christmastime, 1880. A train full of weary travelers winds its way across the rural New Jersey countryside. Some of the passengers doze fitfully, lulled by the rhythmic clickity-click of the rails. Others gaze idly into the darkness, huddling against the cold. All is quiet among the weary travelers save for the occasional murmur of conversation and sighs of boredom. But suddenly there's a commotion, gasps of surprise and delight. Passengers jump to their feet and scramble to one side of the rail car, jostling for a look out the windows. The dark and gloomy interior of the car is suddenly aglow with a bright, white light. It's as if the morning sun itself were on the rise, hours before schedule. The stunned and delighted passengers have been chance witnesses to the very first display of electric Christmas lights, the latest creation of famed inventor Thomas Alva Edison. When Edison's electric Christmas lights first delighted those awe-struck train passengers in 1880, light displays and Christmas had been a natural combo for many a century. 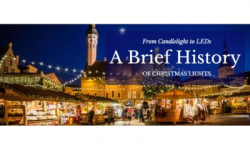 The tradition of Christmas lighting stretches back to the 12th century - the dark ages. It was during this period that Europeans added some cheer to the shortest, darkest days of winter by the burning of Yule Logs. It was believed that the Yule Log helped to repel evil spirits that lurked during the dark, dreary days of the winter solstice - coincidentally around Christmastime. In addition to offering protection against evil spirits, the Yule Log also symbolized the longing for springtime. Over time, the pagan Yuletide traditions evolved into the Christian tradition of celebrating the birth of Christ. And until the invention of the electric light bulb, fire - primarily in the form of candles and lamps - was the only choice available for decorative Christmas lighting. 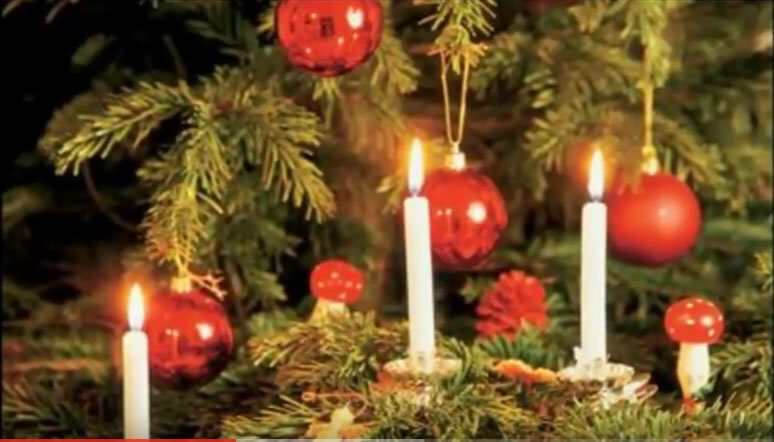 Let's see…a tinder-dry Christmas tree loaded with lots of sputtering candles: A good idea? Well, it depends upon your perspective. There's no denying that a candle-lit Christmas tree can be quite an impressive sight. So if you're considering only the aesthetics of the situation, you might give it a thumbs-up. But if you're thinking about safety, a candle-lit Christmas tree gets a big thumbs-down. Christmas trees didn't become a popular tradition in America until the late 1800s. But Edison's electric lights didn't become available to much of the nation until well into the 1900s. So for a number of years, lighting up a Christmas tree meant using candles. It was a practice that all too often resulted in tragedy. But a Christmas tree set aglow with lights is an enchanting sight. It's a sight that people longed for - so much so that they were willing to accept the inherent risks. Often, families would fill buckets with sand and water - just in case - and light the candles on their trees, only for a short period. Insurance companies, though, were somewhat less enchanted by the combo of candlelight and Christmas trees; many insurers began to refuse claims resulting from Christmas tree fires. Soon after Edison's revolutionary 1880 display of electric Christmas lights, his associate Edward H. Johnson, hit upon an idea - electric Christmas tree lights. In 1882 Johnson assembled a string of multi-colored electric lights and wrapped them around a Christmas tree - a move that likely quelled lots of ulcers among insurance company executives! These days, it's common practice for homeowners to invest lots of money and time on installing spectacular outdoor holiday displays. It's a practice that began to take hold in the 1950s, as America recovered from war-induced shortages of manufacturing materials and energy. 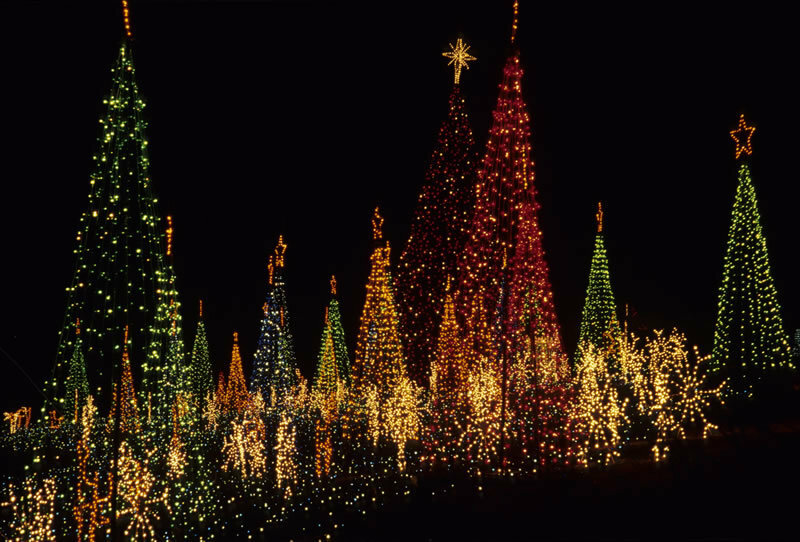 By the 1960s, both businesses and homeowners were regularly installing lots of spectacular outdoor Christmas lighting displays. And in the years since, the tradition has steadily grown. Each year, Christmas enthusiasts are designing and installing lighting displays that achieve new levels of sophistication and grandeur. Technology has contributed to the boom with the advent of LED Christmas lights. Far more energy-efficient and durable than Edison's incandescent lights, LED lights have led the way to the modern golden age of Christmas lighting. Compared to the spectacular Christmas lighting displays that awe and delight us every holiday season, Edison's first Christmas light display was rather plain and simple. From our vantage point, it's a bit difficult to imagine the wonder evoked by Edison's display among those first few privileged witnesses. But though the technology that symbolizes the Christmas theme has evolved, the longing in the human soul for peace and goodwill among men remains unchanged. May it always be so.